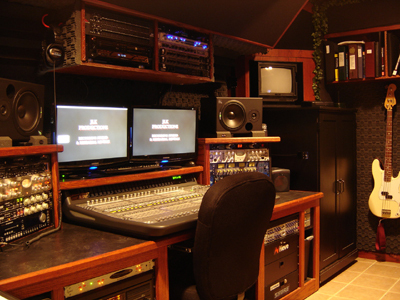 Our recording facility is comprised of 3 rooms: A "live" room, a vocal booth and a comfortable well equipped, control room. 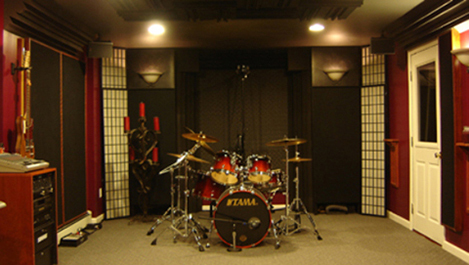 All rooms are professional acoustically treated, providing the acoustic qualities and frequency response necessary for a professional recording. 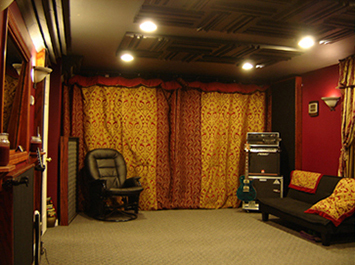 Our 36' x 15' Live Room can accommodate recording at least a 5 member band, live off the floor, so there is more than enough room to comfortably fit you, your gear and whatever you need for your particular recording session. It has removable acoustical wall panels (gobo's), allowing for repositioning and multiple assembling configurations anywhere in our room(s) to accommodate your specific recording needs. 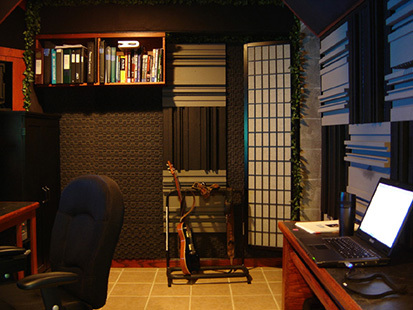 All of our rooms are professionally acoustically treated with diffuser panels, absorption panels, bass traps and acoustical blankets to provide an excellent acoustic response. Our	live	room	is	also	home	to	our	Presonus Studio Live 24 console and PA system, ideal for pre-recording rehearsal sessions, as well as a fantastic sounding Tama Star Classic drum set that is always maintained in pristine condition. Please check out our full list of equipment for details on what we have here. Our 6' x 9' Vocal Booth is a "true iso booth", being structurally independent of the rest of the building and is completely sound proof. It's construction is in fact "a room within a room" and sits on rubber acoustic pads. This eliminates ANY frequencies or vibrations transmitted through the underlying concrete floor, as well as outside noises. Check out our construction process and photographs, if this is something of interest to you. All of our rooms sounds fantastic!!! We are greatly satisfied by the outcome of our time spent planning, the construction and strategic placement of acoustic treatment ... definitely a worth while investment. 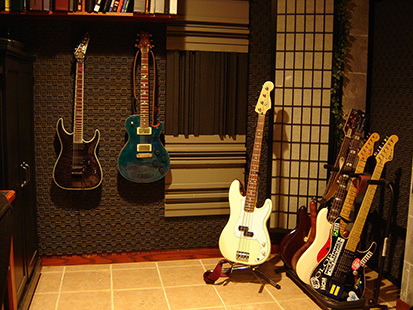 This room is ideal for getting great vocal tracks during a "live off the floor" recording session, where the vocal microphone has to be isolated from loud instruments in one take. 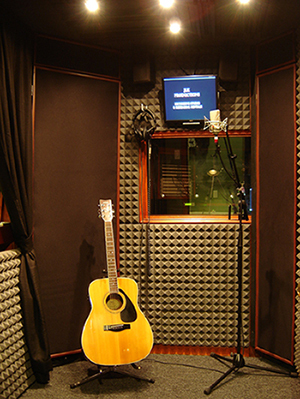 Additionally, this room is the perfect voice over room for radio, TV advertisements, movie sound tracks, you name it. It is equipped with a flat screen TV monitor for cueing and auditioning lines or scripts. A great voice over, auditioning environment for the talent and producer alike, as there is a widow between the iso booth and the control room for visual cues, if needed. Our 15' x 10' control room is spacious but certainly not huge. It is large enough to fit all of our great gear and still comfortably fit 3 or 4 members of the band. In the control room, we are recording, editing and mastering using the industry standard of Pro Tools HD3 (version 8) and Pro Tools 12 through a Mac Pro with 12 Core Processors and 32 gigs of RAM. We can currently record up to 48 tracks simultaneously using Lynx Aurora converters for pristine sonic quality of A/D & D/A audio conversion. We have over 10 terabytes of memory and storage hard drive space including 7 removable "hot swap" hard drives (we also sell 250 gig portable USB drives and 4 gig flash drives). We have a great selection of high quality microphones, pre-amps, outboard gear and of course, the highest quality, award winning, plug-ins for our Pro-Tools system, have a look at our equipment list. Our equipment, skills and knowledge in producing & engineering, as well as, the music industry, will prove to be a huge asset to you and your recording session. We are passionate about getting great sounds and a great vibe here in our studio and we know you will enjoy working with us as much as we will enjoy working with you. If you or your band are new to the process of recording, I encourage you to go through this detailed list of recording tips, to facilitate in a smooth recording session. This will help you to get the most out of your time here. If you follow some of these useful ideas, you will be sure to save a few bucks and feel more confident prior to and during your session. We are proud to be a smoke free studio, however, if you are a smoker, we will be happy to have an ashtray handy on our back patio. Our patio has a table and chairs for outdoor relaxing, a fire pit and a grill.